​behind them in the sky? These patterns are the result of "weather modification" programs — also referred to as "solar radiation management" or "chemtrails"
. 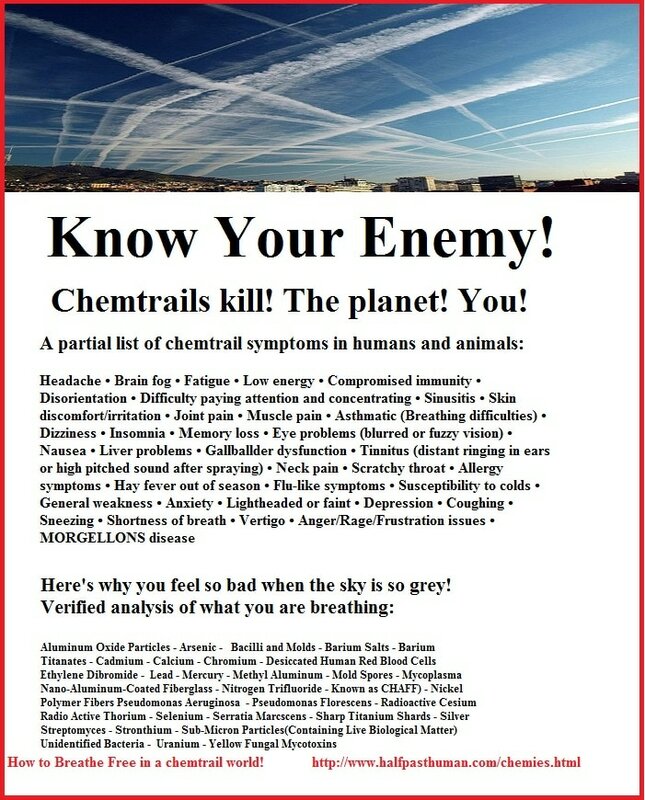 The international program involves spraying aluminum, barium, strontium and other toxic chemicals from airplanes at high altitudes that then fall to the ground, ending up in our bodies, our water, our soil and the air we breathe. WE ARE AT WAR ! We are the Termites Being Sprayed. You have never heard this information ! 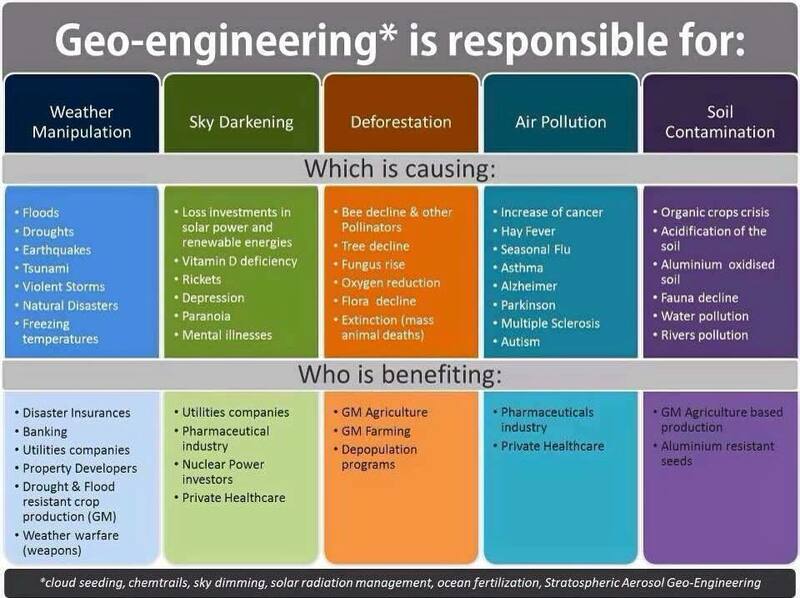 environmental toxins, electromagnetic pollution, etc. Since the emergence of epigenomics, which is the study of how epigenetic modifications affect the genetic material of cells or the entire organism, geneticists have discovered that the human genome is a lot more complex than they have ever imagined. For example, DNA sequencing technologies that are currently available to mainstream geneticists can only decode roughly 21,000 known genes that are involved in protein synthesis in the human body. This only decodes a very small percentage of the human genome. The 21,000 known genes that are involved in protein synthesis make up nearly 1.5 percent of the human body’s DNA. This means that roughly 98.5 percent of the human DNA structure, which is often referred to as “junk DNA”, is yet to be decoded. However, certain advanced DNA sequencing technologies that aren’t available to mainstream geneticists have decoded the human genome beyond the 21,000 known genes. Geneticists have discovered that the human genome consists of not only genes, but also a highly complex genetic switch system, composing of millions of genetic switches. These genetic switches are used by the human body to turn genes on and off. So far, geneticists have found slightly more than 4 million switching sites, which only cover roughly 8.5 percent of the human genome. Each of the millions of genetic switches in the human genome affects certain specific gene activity and expression. When these genetic switches are defected and not working in harmony with the other systems of the human DNA, it can lead to faulty gene activity, which can cause health problems. There are many things that can cause genetic switches to not work properly. One of the most effective things is genetically modified organism (GMO). Certain geneticists believe that the unnatural genetic materials in GMO can interfere with the natural functions of genetic switches in the human body. This is why GMO has been linked to all sorts of health conditions, including but not limited to infertility, birth defects, immune disorders, growth problems, premature aging, and cancer. Besides GMO, food toxins, environmental toxins, and electromagnetic pollution can also interfere with gene activity and expression. Electromagnetic pollution is very effective at disharmonizing the natural frequencies of the human body. To learn about how electromagnetic pollution harms your body, read my informative article titled Frequency Healing and Electromagnetic Pollution. Certain scientific studies have shown that by “tweaking” the epigenome of an organism using nutrients, they can reverse damages done to the genes of that organism. Other scientific studies have found that the way an offspring is raised and nurtured can affect the offspring’s genes in positive and negative ways. The epigenome is just as critical to the development of humans as is the genome. For example, by changing the diet of genetically fat and yellow agouti mice to one rich in methyl donors, found in onions, garlic, and beets, researchers have found that they could change the offspring to slim and brown mice. By epigenetic intervention, they had modulated the critical agouti gene, dramatically changing the mice’s offspring. Epigenomics is still somewhat new but it is already showing some amazing potential for healing all sorts of health conditions. With more research in epigenomics and better understanding of how genes work, geneticists will soon be able to reverse cancer, diabetes, Alzheimer’s, and other “incurable diseases”. To be able to unravel the secrets of genes and DNA, scientists and geneticists will need to study the linguistic structure and electromagnetic property of DNA. They will also need to study the language of the living energy codes of matter, which is made of light, sound, frequency, and vibration. For an interesting article about the language of matter, read my article about frequency and vibration. Eversole, Finley. Energy Medicine Technologies: Ozone Healing, Microcrystals, Frequency Therapy, and the Future of Health. Inner Traditions. Rochester, Vermont, 2013. About the Author Pao L. Chang is the author and founder of EnergyFanatics.com and OmniThought.org, two comprehensive blogs dedicated to exploring topics about energy, health, conscious living, spiritual science, and exotic “free energy” technology. He loves to explore the mystery of alternative medicine, the science of consciousness, quantum mechanics, sacred geometry, and how energy affects the physical, emotional, mental, and spiritual body. During the time of the 75,000 year cycle when we are exposed to the most torsion energy waves and it affects our DNA by reorganizing the 97% “junk” DNA from a 2-strand double helix to a 12-strand helix advancing man in a leap of evolution. Russian researchers’ findings and conclusions are simply revolutionary! According to them, our DNA is not only responsible for the construction of our body but also serves as data storage and in communication. The Russian linguists found that the genetic code, especially in the apparently useless junk DNA follows the same rules as all our human languages. To this end they compared the rules of syntax (the way in which words are put together to form phrases and sentences), semantics (the study of meaning in language forms) and the basic rules of grammar. They found that the alkalines of our DNA follow a regular grammar and do have set rules just like our languages. So human languages did not appear coincidentally but are a reflection of our inherent DNA. This way the entire information was transmitted without any of the side effects or disharmonies encountered when cutting out and re-introducing single genes from the DNA. This represents an unbelievable, world-transforming revolution and sensation! ​All this by simply applying vibration and language instead of the archaic cutting-out procedure! This experiment points to the immense power of wave genetics, which obviously has a greater influence on the formation of organisms than the biochemical processes of alkaline sequences. This discovery also points to the significance of sound frequencies and vibrations in the origin of human life and the possibility that creation was generated by waves of consciousness. The Phantom DNA effect is a case in point: the energy field of a DNA sample remains detectable by laser light even when the physical sample is removed. At a fundamental level, man is pure energy. In Wave Genetics, the junk DNA functions at a rich infrastructure level of super codes and wave communication, realized in material form as crystalline structures–dynamic gene-holograms in liquid crystals of the chromosome continuum. What this model suggests is that the human gene is part of larger holograms (multiverse) of wave information reality. Hyper-communication, in the form of remote sensing, remote healing and telepathy, is definitely a part of the human protocol. In nature, hyper communication has been successfully applied for millions of years. The organized flow of life in insect states proves this dramatically. Modern man knows it only on a much more subtle level as “intuition.” But we, too, can regain full use of it. An example from Nature: When a queen ant is spatially separated from her colony, building still continues fervently and according to plan. If the queen is killed, however, all work in the colony stops. No ant knows what to do. Apparently the queen sends the “building plans” also from far away via the group consciousness of her subjects. She can be as far away as she wants, as long as she is alive. In man hyper communication is most often encountered when one suddenly gains access to information that is outside one’s knowledge base. Such hyper communication is then experienced as inspiration or intuition. The Italian composer Giuseppe Tartini for instance dreamt one night that a devil sat at his bedside playing the violin. The next morning Tartini was able to note down the piece exactly from memory, he called it the Devil’s Trill Sonata. When hyper communication occurs, one can observe in the DNA as well as in the human being special phenomena. The Russian scientists irradiated DNA samples with laser light. On screen a typical wave pattern was formed. When they removed the DNA sample, the wave pattern did not disappear, it remained. Many control experiments showed that the pattern still came from the removed sample, whose energy field apparently remained by itself. This effect is now called phantom DNA effect. It is surmised that energy from outside of space and time still flows through the activated wormholes after the DNA was removed. The side effect encountered most often in hyper communication also in human beings are inexplicable electromagnetic fields in the vicinity of the persons concerned. Electronic devices like CD players and the like can be irritated and cease to function for hours. When the electromagnetic field slowly dissipates, the devices function normally again. Many healers and psychics know this effect from their work. The better the atmosphere and the energy, the more frustrating it is that the recording device stops functioning and recording exactly at that moment. And repeated switching on and off after the session does not restore function yet, but next morning all is back to normal. Perhaps this is reassuring to read for many, as it has nothing to do with them being technically inept, it means they are good at hyper communication. In their book “Vernetzte Intelligenz” (Networked Intelligence), Grazyna Fosar and Franz Bludorf explain these connections precisely and clearly. The authors also quote sources presuming that in earlier times humanity had been, just like the animals, very strongly connected to the group consciousness and acted as a group. To develop and experience individuality we humans however had to forget hyper communication almost completely. Now that we are fairly stable in our individual consciousness, we can create a new form of group consciousness, namely one, in which we attain access to all information via our DNA without being forced or remotely controlled about what to do with that information. We now know that just as on the internet our DNA can feed its proper data into the network, can call up data from the network and can establish contact with other participants in the network. Remote healing, telepathy or “remote sensing” about the state of relatives etc.. can thus be explained. Fifty percent of today’s children will be problem children as soon as the go to school. The system lumps everyone together and demands adjustment. But the individuality of today’s children is so strong that that they refuse this adjustment and giving up their idiosyncrasies in the most diverse ways.